This beautiful image symbolises a true family Christmas, with the beautiful rich green pine tree radiating elegance and charisma, you could imagine this tree surrounded by children dancing in their P.J.’s with excited little faces for Santa’s arrival. Or perhaps family members celebrating the festive holiday season with a glass of their favourite tipple! 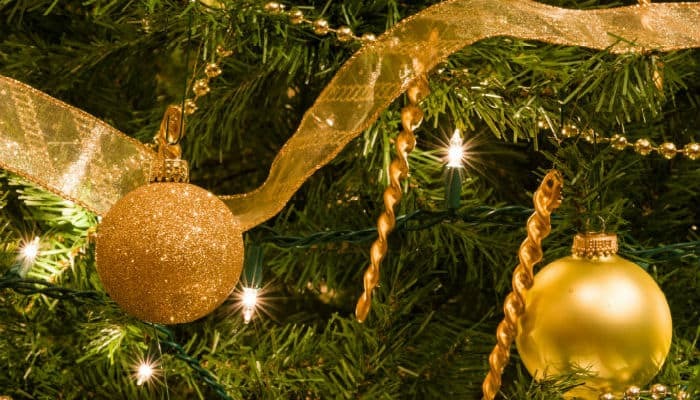 The tree is beautifully decorated with gold baubles that hang delicately and shine as the Christmas ecards for business are played. One of the baubles is decorated with glitter and shines lovely, the other bauble is painted plain gold and shines and twinkles. The fairy lights glimmer and glow cosily when the card plays and you think of home as the card plays. At the ecard shack, we specialise in creating our cards with charm and nostalgia in addition to providing a corporate professional image. Our holiday ecards for business are very effective and have incredible real life animation and we always aim to please every time. So please feel free to contact us if you need any assistance with designing your ecards. We have a full customer support team ready to help at any time. So if you need assistance with uploading your company logo, adding signatures or moving the text around. Whatever your query, we’re happy to help!